Barcelona manager Ernesto Valverde was not the least bit impressed by Chris Smalling’s dangerous challenge on Lionel Messi. 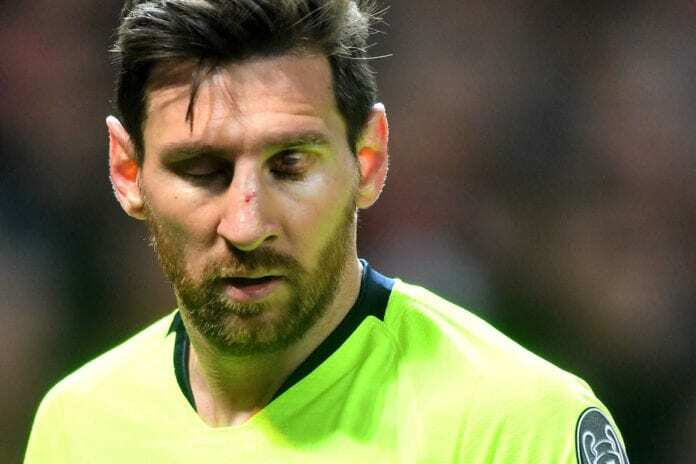 The English centre-back’s elbow caught Messi in the face while he challenged for the ball in the centre of the pitch (see video below) during Barcelona’s 1-0 Champions League win at Manchester United on Wednesday. The Argentine superstar was left with a bloodied nose and eye afterwards and required medical attention. However, he still managed to complete the game despite Valverde confirming he had sustained a “significant bruise”. Therefore, it’s unlikely Barcelona will risk Messi for Saturday’s trip to bottom side SD Huesca in La Liga. “It is possible that Messi rests, the blow was strong, as if a train runs over you,” said Valverde, according to Goal. Smalling revealed on Friday morning that there was no animosity whatsoever between himself and Messi after the match. Although Barcelona seem set to receive a welcome boost for this weekend by the return of Ousmane Dembele, who had been sidelined with a hamstring injury. Furthermore, Luis Suarez seems certain to be available as well despite appearing to struggle in the latter stages at Old Trafford this week. And, in light of the first leg victory over United in their Champions League quarter-final tie, talk of Barcelona winning a treble for the first time since the 2014/15 campaign has grown even stronger. 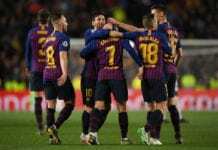 Aside from going strong in Europe, the Blaugrana hold an 11-point lead in La Liga and will meet Valencia in next month’s Copa del Rey final in Seville. “I think last season we were also in the same position at the same stage and we won two trophies [La Liga and Copa del Rey],” said Valverde. “But we haven’t won any at the moment. We’ll be happy with one, happy with two and ecstatic if we win three. Previous articleQuiz – How much do you know about Aaron Ramsey? Gylfi Sigurdsson was the undoubted player of the game as Everton beat Manchester United 4-0 at Goodison Park.